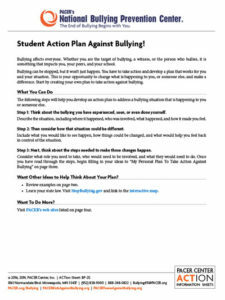 Ready to take action to address bullying? Maybe not sure how to start? As a student, bullying is something that impacts you, your peers, and your school – whether you’re the target of bullying, a witness, or the person who bullies. Bullying can end, but that won’t happen unless students, parents, and educators work together and take action.